Home - See Frontier Town Water Park Hours. Mini-Golf is FREE to Frontier Town & Fort Whaley Registered Campers during Spring & Fall from 8:00 AM – Dusk! About - Bring the kids to Frontier Town Water Park in Berlin MD with a large splash pool, cool slides and lazy river. For the adults, stop by our Pool Bar! 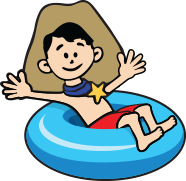 Welcome and Announcements - Take the little ones to splash in the Waterin’ Hole! Challenge the family to a race down our giant triple-lane water slide or try the Tubin’ Flumes! Videos - Watch videos of all the fun guests are having at Frontier Town Water Park Berlin MD right outside Ocean City MD! Enjoy a whole day of wet fun at our park! FAQs - Find out answers to frequently asked questions about Frontier Town Water Park like What amenities are available inside the park? Hours and Pricing - See general rates for admission and our regular summer hours for Frontier Town Water Park in Berlin MD outside of Ocean City Maryland. Gallery - View photos of our big flumes and slides, giant splash are for the little ones including our wagon and more at Frontier Town Water Park outside OCMD.